Perfectly layered flavors of spoon-licking, creamy, delicious vanilla pudding slathered over vanilla wafers and topped with thinly-sliced ripe bananas in a vape you can taste layer by layer. 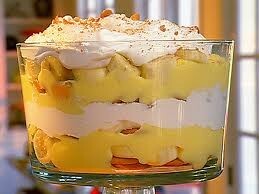 If you love eating banana pudding poured over vanilla wafers with sliced bananas in it, you'll love this one. Excellent banana wafer vape. You can taste the banana on the inhale with the wafers on the exhale mixed with the pudding. Excellent vapor and flavor with a nice TH. Customer service is top notch. Lightning fast shipping. 5 stars across the board! I have been looking for a banana vape that is more of a sweet ripe banana than a banana candy flavor. All the previous juices I have tried failed. This flavor hit the nail on the head! Absolutely amazing and exactly what I have been looking for. Thanks again AltCig! Absolute perfection! Ripe bananas and creamy pudding on the inhale, vanilla wafers on the exhale. An all-day vape that can't be beat! I wouldn't change a thing! Ordered NanaGram at the suggestion of someone on ECF. (Thank you Meems) I already love the Banana Milkshake so hadn't thought to try another banana flavor. Wow, I'm glad I did. I love how I can taste the vanilla wafers *and* dreamy creamy spot-on banana flavor throughout the vape. This is one WICKED AWESOME juice here folks!!! If you like the taste of real bananas...you've got to try this one. You will not be disappointed! Every AltCig flavor I have tried has made me a Vape Happy gal! Banana pudding pie complete with nila wafers and whipped cream. One of the best flavors I have ever tried. Just amazing. Shipping was really fast, and the fact that I got a small hand written letter from them made everything even better. I am definitely a regular customer now. I don't know how they do it?This is a awesome flavor ,graham cracker crust,you will love it!